Brief summary of venue Trident is an attractive kloof whose proximity to Johannesburg makes for a very pleasant day’s outing. Route finding is reasonable as one can orientate oneself without too much difficulty. 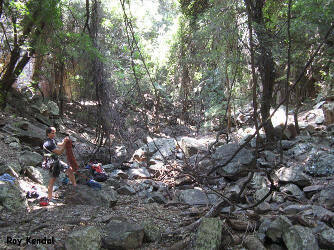 Hiking is limited but pleasant with easy access up through the kloof to the upper reaches. While there is no swimming there is permanent water in the lower part and upper reaches of the kloof. There is good birding and some magnificent trees. There are a number of nettle bushes so one needs to keep one’s eyes open! Access is restricted to Cavern Kloof only. Permit/ permission info Permission is for MCSA members and one guest per member only. The owner requires to be notified by Tuesday before the weekend one wants to visit. The MCSA has a legal servitude over the property. Approximate travelling time from Johannesburg Travelling from the northern suburbs of Johannesburg is approximately 1 hour. Access is from the northern side of the range only. It is some 20 kilometres west of Hartbeespoort Dam. Parking information Parking is in a fenced off area located close to a local landowner. While it is open to the public there have been no incidents reported to date. Local landowners’ dogs will almost certainly be a deterrent to prying eyes. Cost is R20 per car, and the money is deposited into a metal safety deposit box at the parking area. Info on walk in Trident is an easy, short and pleasant walk in, taking about 35 minutes. After a short walk past the local homesteads one follows a track that winds its way through shady bushveld trees with lots of birdlife barking. 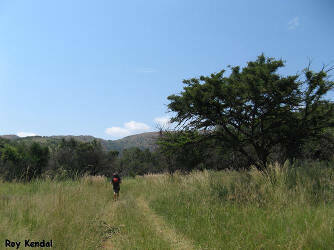 The track leads into the bottom of the kloof and it is then a short walk following the stream to the meet spot. Accommodation Camping is not permitted. Availability of water for drinking There is permanent water in the kloof even in the dry months. Climbing route guide A comprehensive guide has been publish by the MCSA and is available to purchase on Wednesday evenings at the club house. Copies may be available at local climbing shops. Climbing information There are about 100 climbs written up in the guide book. The majority of routes are trad with only a very few bolts having been placed. There is currently a moratorium on bolting in Magaliesberg. Grades range from easy (7/9 - D/E1) to fairly difficult (23/H1). There are plenty of routes in the moderate grades of 15 – 20 (F2 – G2) with many three to four star lines. The routes in the upper section of the kloof are mostly on the True Right and generally two pitches in length, about 45 to 60 metres high. 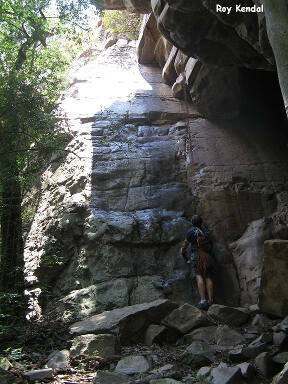 In the lower section of the kloof climbs are on the True Left and average 35 metres. Many of the more recently opened routes are single pitch climbs in the lower section and are around 25 to 30 metres long. Climbing is on both sides of the kloof although the majority are on the east side (true right) which enjoys sun later in the day. Descent is mostly by walking off although there are, in places, suitable trees to abseil down. Child friendly The walk in is gentle with no slopes or hills to climb or descend. Although there is no swimming there is space to run around. There are nettles about but these should not pose a problem. Swimming Swimming is not allowed as per the servitude agreement. 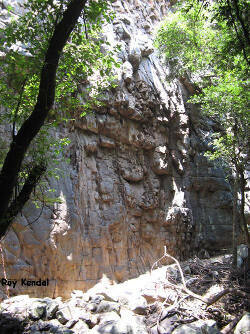 The stream only flows in the lower part of the kloof, although in summer it may flow throughout the kloof. There are no significant pools. 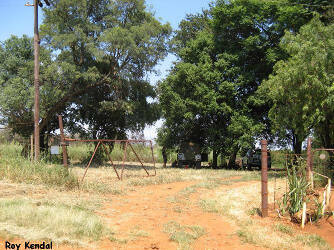 Other attractions Good birding in the walk in and in the kloof, which is very treed. Small game has been spotted (porcupine) with baboon, klipspringer and possibly mountain reedbok on the slopes. At the very top of the kloof, as it breaks out onto the escarpment, there are old British blockhouse ruins dating from the Boer War. Dangers There have been no recorded incidents at Trident. A first aid kit is kept in the kloof and is maintained by the search and rescue team. Contacts Jhb MCSA, email: admin@jhb.mcsa.org.za. Tel: 061 461 8259 (15:00 – 18:00 weekdays).